One issue that most Internet marketers encounter in every day is plagiarism. NO matter whether your business is related to SEO or not, plagiarization is something that you should pay your close attention. Don't want reading? Click here to jump to Plagiarism checker tools list. Why plagiarism matters so much for your business? According to Vocabulary.com, they explain the meaning of “plagiarism” like this. When you rip off someone else’s ideas or work and pretend it’s your own, that’s plagiarism. Read that citation again carefully. When someone steals your content and pretend it is as their own work, it is known as plagiarism or piracy. Why does plagiarisation matter to your business so much? Even you’re a teacher, college student, university professor, freelance writer, data entry worker or offline article writer; plagiarism matters to your business directly. For example, let’s say you’ve got an order from a client to write an original article about “The Truth about Abs…”. He is going to publish that article on their blog. As you might know, weight loss & fitness industry is way too competitive. So, there are more chances to get your article being plagiarized? What does that mean “getting your article plagiarized”? Yes, plagiarism could be made unintentionally. The more common (and widespread) and lengthier your content is, there are more chances to add up similar sentences to your article. That ends up with having more similarities. Ok, Chamal…. Nice words… I am actually convinced about plagiarism issues. How do I get rid of plagiarism? Is there a better way to check plagiarism online? Yes, luckily for you, there are a few plagiarism checkers. Some are free plagiarism checker tools that work efficiently online while others are plagiarism software that works on your PC, laptop, and even your mobile device. As a blogger and SEO guy, I have used a few online plagiarism checker tools. They can detect plagiarism quickly and give the location of other copied content. While a very few of those plagiarism detectors can compare each document/webpages/essays. …Without further ado, I will list my best plagiarism checker tools that I have used and found on the Internet. Feel free to use ANY of below anti-plagiarism checker tools. Note: There’s no ANY descending order of the list. So, you can always try ANY plagiarism detection tool and find the best one that suits your needs. For example, if you’re a school teacher, student or even an average person, you may use a free plagiarism checker. But, if you’re an article writer (doing writing as your professional job) and especially an SEO guy, then you should look for a premium plagiarism checker. If you know ANY other tool that you love using for every project to check plagiarism, share it in the comment form below. I will check it out, and if it’s capable of, I will surely add it up to this list. Grammarly is my personal writing aid that I use entirely in every day. Grammarly is a powerful online grammar checker, punctuation corrector, better proofreader and in fact, a perfect vocabulary builder that can make your articles errorless, easy-to-read, search engine friendly and a human-friendly ones. I am not going to very detailed about Grammarly here. But, if you want to learn more about it, refer to my comprehensive and unbiased Grammarly review article. Once you created your Grammarly premium account, you are ready to scan ANY document for finding plagiarism. Step #2: Hover over the “Plagiarism” icon on the left sidebar and enable the plagiarism checking feature. Step #3: Wait a few seconds till Grammarly’s plagiarism tool scans indexed web pages to find content equalities. Once Grammarly scan over and detected ANY similar sentence or words, they will be underlined by a yellow line. Look at this screenshot. As you see, Grammarly has identified that a few sentences are already put in somewhere. In the writing score box, you can find the text “Unoriginality” or “Plagiarism” percentage. The higher the number, the better work you’ve done. To find the web page URL of copied content located, just click on the underlined text. Not only Grammarly works on online as a web application but also works on your PC, laptop as well. So, if you want to check plagiarism for articles you write in Microsoft Word, you’re just a few clicks away to do that. All in all, Grammarly’s Plagiarism Checker is an efficient tool to detect copied content. So, if you’re looking for a perfect tool that checks grammar and punctuation online while work as an excellent plagiarism checker, I recommend you to use Grammarly. Another useful tool to detect already existing content on the entire Internet. SMallSEOTools.com provides various SEO and content writing tools. Its plagiarism checker tool is a relatively new one. But, it has proven to work very well for many document types. The best part is it is a free plagiarism checker tool. So, you don’t have to pay a fee and on the other hand, don’t have to download any software work with. It detects content piracy seamlessly. But, the downside of this online anti-plagiarism tool is you’re limited to 1000 words per search. But, the downside of this online anti-plagiarism tool is you’re limited to 1000 words per search. So you couldn’t check over 1000 words in a search. However, Small SEO Tools provides an excellent free plagiarism checker for school kids, college students and teachers. Once you pasted your content, you could start detecting plagiarism by clicking on “Check Plagiarism” button. After a few seconds, you will see the result. If any sentence already exists on the Internet, they will be marked in red color. That means you have to rephrase those to minimize the duplicity content rate. DupliChecker is another free online plagiarism detector which perfectly suits students. As SmallSEOTools’s plagiarism checking tool, the main con of this tool is you are limited to check up to 1000 words per search or article. Another simple, easy-to-use free plagiarism scanner tool. This tool also works similarly as above tools. As DustBall.com website claims it is a free plagiarism checker for teachers. Test it and see whether it can check homework and assignments of your students efficiently. The most popular anti-plagiarism checker tool for many webmasters and bloggers. Unlike other plagiarism checker tools, CopySpace detects plagiarism only web content. That means you have to enter a URL to find already existing content which is slightly similar to your article. Another useful tool to find duplicate content on the Internet. If you’re a webmaster and an SEO, you are going to like this tool. Because not only you can find duplicate content on your website or blog, but also other essential SEO metrics such as broken links. SiteLiner is a free plagiarism detector tool. So, go now and find whether your website has the duplicate content issue on your site. SiteLiner is a free plagiarism detector tool. So, go now and find whether your website has the duplicate content issue on your site.Meanwhile, don’t forget to check what Google say about Duplicate content over here. The seventh of my best online plagiarism checker tools list is Plagiarism checker by SEO Tools Station. As the name implies, this website provides different online tools for SEO purposes. As we know, content marketing is a part of SEO now, writing 100% original content has become an essential thing in search engine marketing space. That’s why SEOToolStation.com developed an excellent free plagiarism checking tool for webmasters. As we know, content marketing is a part of SEO now, writing 100% original content has become an essential thing in search engine marketing space. That’s why SEOToolStation.com developed an excellent free plagiarism checking tool for webmasters. You can scan ANY content to find duplicate content. They support all these three methods. But, like other free online plagiarism checker tools, the downside of this one is you’re limited to check up to 1000 words per a search. Give this tool a try and see whether it suits your needs. QueText – A complete free plagiarism detector. Your document will be analyzed based on lexical frequencies, phrase patterns, and many other factors. QueText ignores quotations and common phrases. And it is a plagiarism checker online free with percentage. So you could find how many amounts of the entire article is plagiarized. Plagiarisma – A multilingual plagiarism checker tool which currently supports over 190 languages. You can download plagiarism software free for computer or use the online tool, their web browser extension or install the mobile app on your android and blackberry phone. PlagTracker – Yet another free plagiarism lookup tool that works similar to Small SEO Tools. 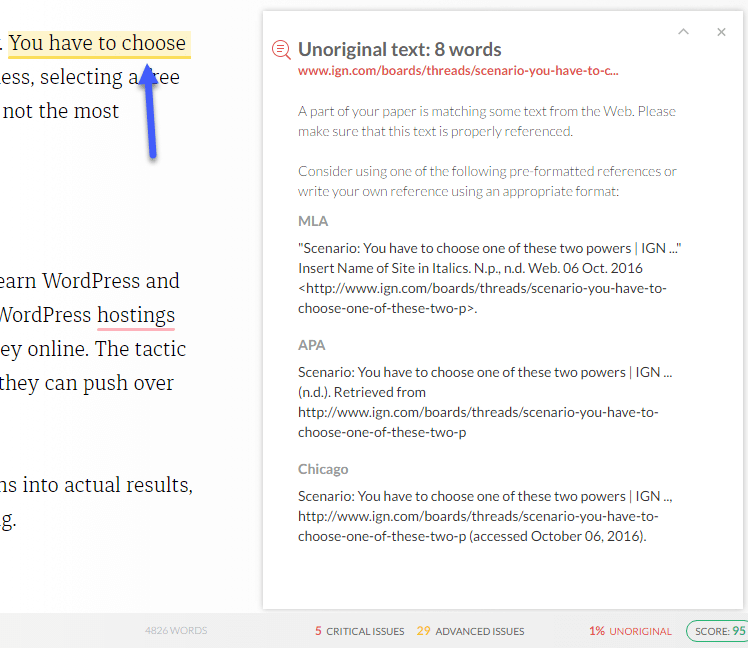 WriteCheck – The plagiarism tool by TurnItIn. Their pricing starts from $7.95 (per 5,000 words) + Resubmissions. A paid plagiarism checking tool. PlagScan – A paid plagiarism checker tool with flat rates. Viper Plagiarism Scanner – Viper Plagiarism Scanner by ScanMyEssay is a software that can be used to detect similarities between multiple documents. It is a good alternative to Turnitin (WriteCheck). It is a reasonable thing getting your article plagiarized. However, I have lots of experiences how content theft matters for business. I have lost hundreds of valuable customers. Subscribers and loyal readers due to unknown content plagiarism issues. You may not know that you’ve made a copyright infringement. You might not feel there is anything wrong with your business. And you haven’t done any guilty. But the time goes, branches will spread like cancer. So, before being it a plague, you must get rid of plagiarism issues. I personally use Grammarly for my writing activities. While Grammarly primarily is a grammar checker tool, I also don’t forget to use its Plagiarism Checker every time I am ready to publish an article online. I don’t insist you to use Grammarly, but I can suggest you to use Grammarly at least once to try it for your next plagiarism check for your essay, assignment, legal letter and email. So, what is your best plagiarism checker tool or program? Share your opinions in the comment form below. I will reply to every comment you share. Excellent! Let me know how new tools vary from others. Chamal this is a great list. Another tool I would add is Copyleaks As a blogger I’ve been using this the past 5 months after seeing my content was being taken and duplicated on a few other websites I did not give permission to. I suggest this for anyone publishing content online!